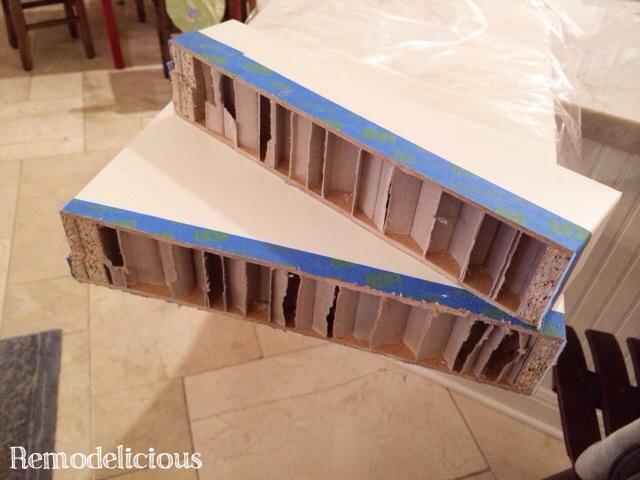 Ever wonder what’s inside an Ikea LACK shelf? If it can be cut down to size? It can be, but they are flimsy and you’ll only want to do it if you’re putting the cut end up against a wall. I’ve now cut 3 of these so I thought I’d share. The first time I used LACK shelves was in the sitting room at our last house. They happened to fit between two walls with around 1/2″ to 3/4″ to spare which you really need because walls are never perfectly straight, you need to allow for texture, and that 1/4″ gap on each side really goes unnoticed. These are the large size in the dark finish. The next time I used LACK shelving was in my new study where I put 6 of them together to create two long shelves. I was inspired by this much more expensive home my family built for a custom home client. If I had done staggered shelves like this, it would have been much easier so this is a look you can consider instead of cutting them to size. Back in my study, I used 6 of the medium sized LACK shelves. When I measured, lining 3 of them up side-by-side was the perfect width for the space with 1/4″ to spare. When I actually went to hang the final shelves on the right side, they wouldn’t fit because of the subtle saves in the wall. The side wall was tighter farther away from the back wall where I had measured. Since these are installed by sliding them back onto their hardware, that didn’t work out. So I trimmed them. I ran into this problem again installing a long LACK shelf in the laundry room. When I measured, I knew it would be tight, but thought I could scoot the washer and dryer over a bit (but actually could not). After stepping back and looking at the space, I decided that the perfect length would be 2 inches shorter. 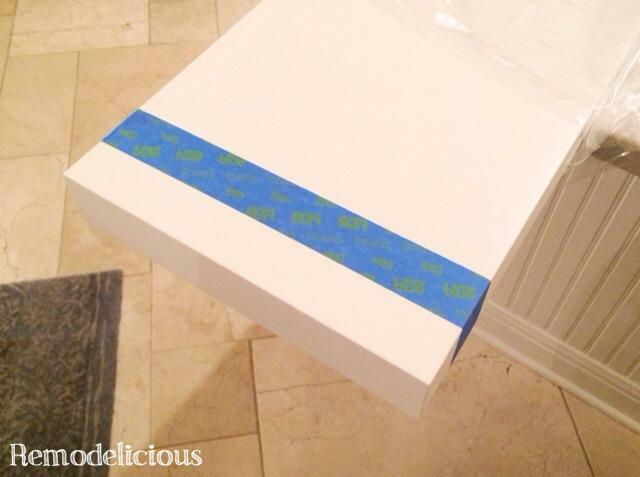 First, unwrap the end of the shelf that you want to cut. Pay attention to where the final screws go. I wanted them on the bottom, so I made sure that I was cutting from the correct side. Only the left side would be up against a wall, so I made sure that I cut on the left side, looking from the front with the screws on the bottom. I didn’t unwrap the entire shelf so it would be protected while being moved around. 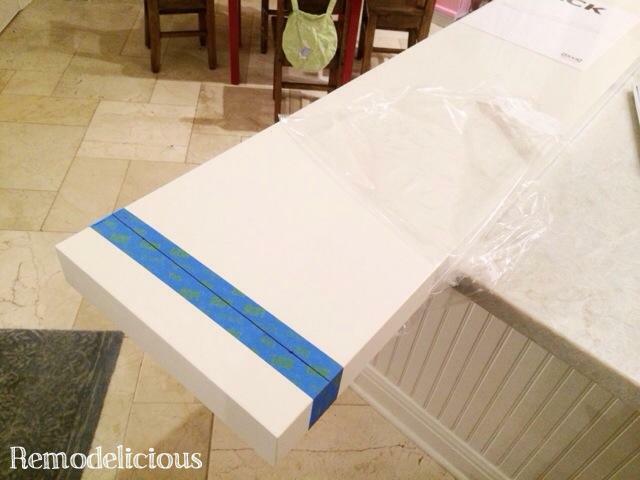 Wrap the shelf in blue tape – all the way around. Mark your measurements. 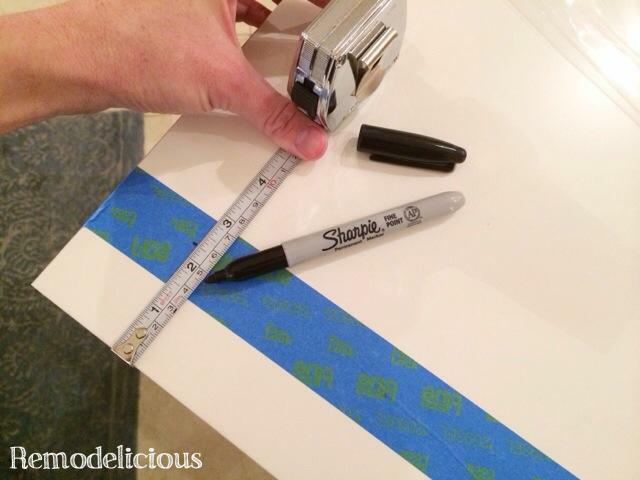 I wanted the shelf 2″ shorter and measured to 2-1/4″ to allow for variations in the wall. Draw a line all the way around the shelf (unless you have a saw that can cut all the way through it, most of us don’t). No action shots here, but here’s the inside of a LACK shelf. Now you can see why they are so cheap! I used a circular saw to keep the cut as straight as possible. Cut one way all the way across, then turn the shelf over and cut again. I started at the front of the shelf so it would have a great line. As you can see, on the back of the shelf (on the left) my lines didn’t line up perfectly. So that’s how you can cut a LACK shelf should it not fit perfectly in the space you want. Update: If you need a pretty edge on the cut-side, consider peeling the end off of the trimmed-off piece and gluing it back onto the shelf. I haven’t tried this, but it looks possible. Another note: The next problem with hanging LACK shelves in very specific spots is that the holes almost never line up with a stud. I don’t hang shelves on drywall anchors alone since I use them for books & other heavy objects. I put a screw in each side to hang the hardware where I want it to go and then find studs. I double check by drilling a tiny hole and making sure that it hits the stud. I mark where each stud is on the metal LACK hanging hardware and drill new holes using a Cobalt drill bit. 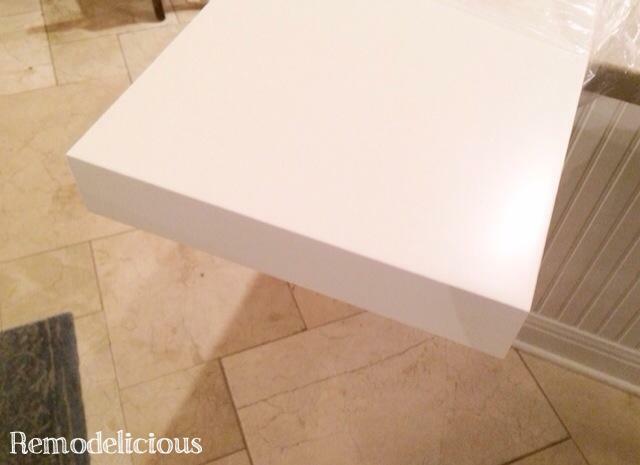 The top hole is most important to keep the shelf from bending downward under weight. I drill into as many studs as possible. If the nearest stud is far enough away from one of the rods that holds the shelf that it will move easily when I press down, I use drywall anchors to steady it – but not the awful IKEA ones; get the good ones from any big box store. The laundry room is getting close to photo ready. You know where to watch for photos! Thank you for posting this! I have a wall space that doesn’t quite fit the LACK selves and was uncertain if I should buy and try to cut. Now I know it will work, thanks! How in the heck did you get the Lack shelves lined up so uniformly? I’m envious! I put two next to one another and it was a nightmare of slightly-off. Any tips? I was super careful and took my time. It was extremely helpful to use a laser level to make a level line across the entire wall. Then I used a straight edge (yardsticks & levels work great) to draw the line onto the wall in pencil. I lined the top of IKEA hardware bars up with that line, that way the back of the shelves were lined up. You get what you pay for with the LACK shelves so I did have to do some manhandling after the shelves were up to get the fronts to line up correctly. Even after everything, some shelves are my “heavy item” shelves and some are my “light item” shelves. It’s odd because I drilled holes in the hardware (with a cobalt drill bit, they don’t break as easily) so that every shelf was connected to at least 2 studs. Yet, some of them are still wobbly. I haven’t had this problem in other places where I’ve used the shelves so I may not have done as great a job doing 6 all at once. When I installed one over another with drywall anchors (not the IKEA ones, nice hardware store ones) it worked great, and our laundry room install with the single, cut down LACK shelf also installed well with holes drilled to line up with our existing shelves. The best way to use LACk shelves is when you have some room to play with so you can make sure that you get as many screws into a stud as possible. Unfortunately, that is rarely an option. Best of luck! Let me know if you have any other questions! Woo hoo! I was wondering if these could be cut, thank you so much! But how did you handle the Galvanized steel Suspension rail??? i want to make a custom desk out of ikea parts and dont like any of the table legs. Do you think that one LACK shelf cut and stuck together would be strong enough with the KALLAX and CAPITA as the other legs for a EKBACKEN to stay up quite well with 3 monitors? I have bought the shelves 4 months ago, still waiting on the corridor because they needs to be 1 cm shorter. now I will have my shelves and my corridor back. What is the maximum you would be able to cut from each end (what is the distance between the end of the metal support bar and the end end of the shelf as purchased)?